Jane’s Walks Are Upon Us! For one weekend every year, cities across the world play hosts to Jane’s Walks, a collection of walking tours of our urban areas to explore, discover, and learn. Anyone can host a walk, and there are plenty of themes. 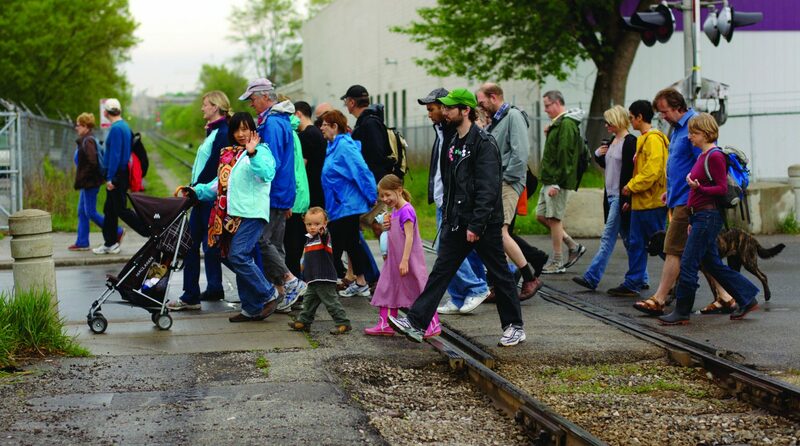 This weekend, Waterloo Region will be host to dozens of different Jane’s Walks. Given TriTAG’s collective obsession with all things transportation, we thought we’d highlight a few for you! Click through for full walk details including length, meeting points, and other details. As you’ll see, exploring the history of transportation in our cities is a common theme. This walk is led by the Waterloo Public Library’s Local History Manager, and will explore the ways people arrived at and moved around the Village, Town and City of Waterloo. Not an actual walk, but on the other hand you’ll get to explore the City of Waterloo’s bike friendliness directly, with no other than Councillor Diane Freeman, long time advocate and supporter for better bike infrastructure. This trip on two wheels starts at the Market and goes to Uptown. If you’re interested, definitely click through for additional important details. The history and ongoing development of this key piece of the central transit corridor, along with the direct and indirect impacts and influences of ION and intensification. What’s not to like? 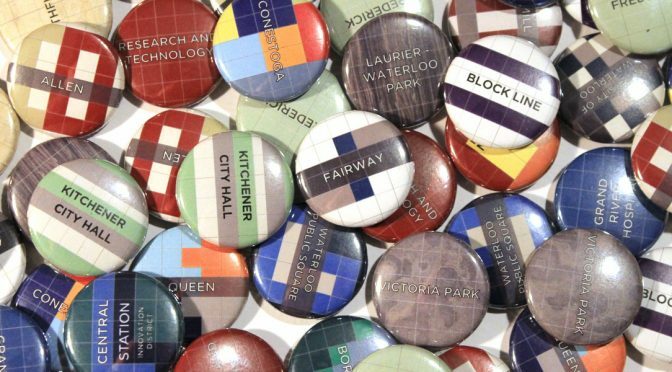 If downtown K-town is more your beat, then let Todd Bowman lead you around the core and talk about the history, evolution and influences on the city of different transportation modes over the years, from walking and biking to driving and transit! So get out there and see our cities! Jane’s Walks are a great way to connect with the places we live in and the people we live with. Just remember to bring an umbrella. Let’s make the connection: how can you help? 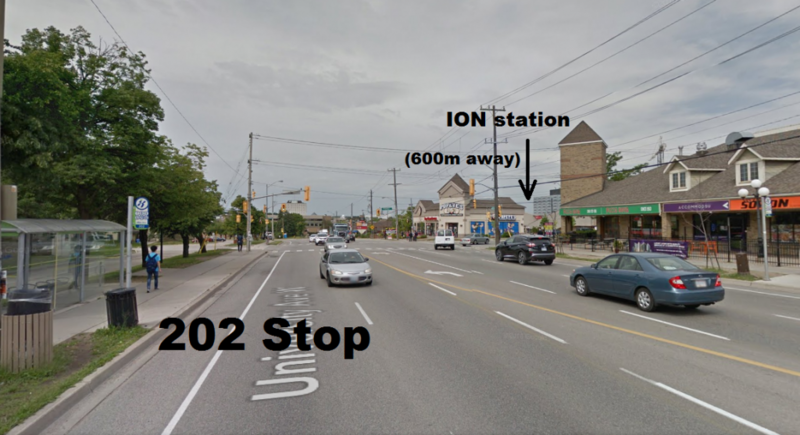 Last week, we talked about the gap in transit planning around ION and the 202 University Avenue iXpress. Click here to read the details. The Waterloo Region Record has also published a story, and we’ll be on CBC radio Tuesday morning at 7:40 to discuss it. How can you help ensure that connections are in place for ION and GRT iXpress buses on University Avenue in time for 2018? Give GRT your feedback! Follow that link to learn about the UW transit plaza and find a link to submit your feedback. Tell GRT you want them to live up to their key priority of building seamless connections to ION light rail. Tell the University of Waterloo what you think. Contact the president’s office and explain that UW needs to step up and help our community get maximum value for our transit money, rather than obstructing good transit access to ION. Let the 202 pass! Student or alumnus of UW? Contact the UW Feds and tell them you want the University to work with GRT, not against them, in order to make your own transit experience along University Avenue better. With your help, we can make the connection. Missing the connection: Will the University iXpress bypass ION? Grand River Transit is investing in a new transit plaza next to the University of Waterloo’s ION station. But they have no stated plan to connect the 202 University iXpress with this location. In fact, they propose to have the 202 drive over the tracks and not stop near ION at all. How could this be? See the plans yourself, and then tell GRT you want the 202 to connect with ION. Imagine that it’s early 2018, and ION has begun service. A young woman leaves her home in the Beechwood neighbourhood bound for work. Instead of getting in the car as she normally would, she walks towards the closest bus stop. Today she will find out if ION works for her. It’s a short walk to the bus shelter, and a short wait for her bus to arrive: a 202 University iXpress. It quickly carries her along Erb to University Avenue, then through campus and she steps off the bus just metres away from the ION platform. It’s a quick and convenient transfer as the train glides smoothly into the station as she walks up and just like that, she’s on her way downtown. Now imagine instead, her bus drives right past the University of Waterloo. There’s the unmistakable thump-thump of crossing railway tracks: surely, this must be the place to transfer. But no, the bus keeps going. She gets out at the very next stop, beyond Phillip St. She doesn’t know the area, and she can’t see the station anywhere around here. She asks a passing student, who points back towards the tracks. She starts walking. Despite crossing each other, the 202 and ION stops are a long way apart. It’s almost 10 minutes before she has found her way to the ION station. By now, she’s cold and annoyed. These iXpress buses were supposed to connect seamlessly with the train, she thinks. Do they actually expect her to walk all this way every time to catch her train downtown, and then find her way back to this bus stop in the evening? Why does her bus completely bypass the light rail line whose tracks it drives over? She can’t understand why anyone would think this was a good idea. She resolves to go back to driving tomorrow. Of all these routes, the 202 is the most vital to connect with ION. Sadly, it is this latter scenario that we are being set up for. GRT revealed its plans for the new UW transit plaza and route adjustments in the area to connect here, and those plans specifically exclude the 202 University iXpress. 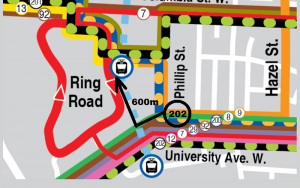 Despite the creation of this plaza and the placement of the UW ION station, the University of Waterloo wants to block bus access to sections of Ring Road. The 202, serving our region’s second largest transit corridor, is a casualty of this decision, currently relegated to bypass ION and stop a long distance away. 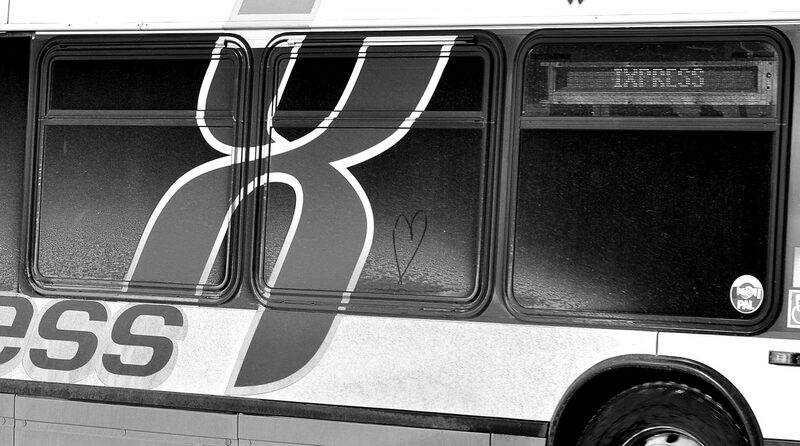 The 202 is Waterloo’s best cross-town route, extending to Erb West and University East. But there are alternatives. There are ways to make this work. Unfortunately, Grand River Transit appears to be proposing inaction when they presented to the public last week. The vision of iXpress cross-town lines feeding the ION transit spine may well be abandoned where it is most critical. We must ensure that this connection happens. GRT needs to step up, and deliver a solution. And if GRT can’t bring the 202 to the UW transit plaza, then it should instead be routed to connect with ION at the Laurier-Waterloo Park station on Seagram drive. Why not connect 202 with ION on Seagram, and also provide Laurier with an ION shuttle at the same time? Making these connections between ION and iXpress is of paramount importance to ensuring that our investment in LRT benefits more than those who live and work immediately adjacent to the line, because they connect ION riders to many more destinations outside the central transit corridor. It’s not too late to tell GRT directly that you want to see the 202 iXpress bring you to ION’s doorstep. 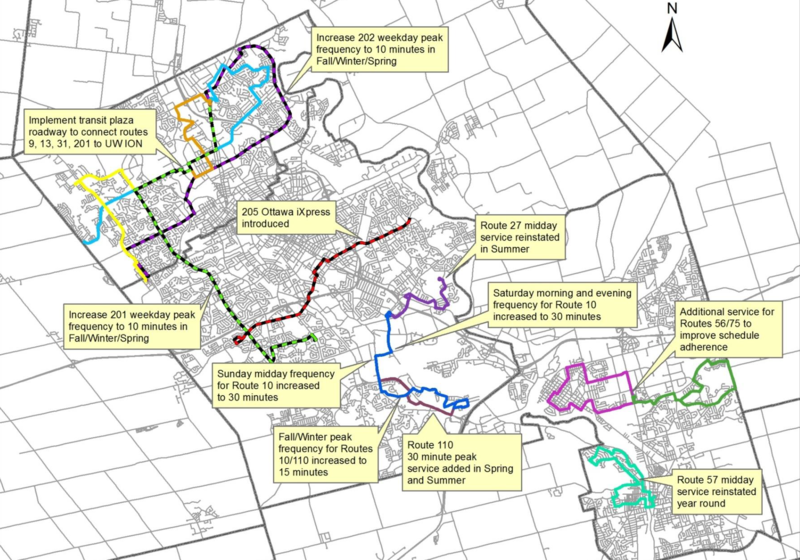 You can see GRT’s plans yourself, and submit your comments online. Let’s help our transit planners make the connection. Find out other ways you can help to make the connection. What’s in store for Grand River Transit? What’s in store for GRT? As we prepare for the arrival of ION, the region’s Transit Services has given us a glimpse into the next few years of Grand River Transit. Here at TriTAG, there’s nothing we like more than a thick PDF full of juicy planning details. We dive into the Interim Report on GRT’s 2017-2021 business plan so you don’t have to! A streamlined Route 7 on King and Connaught. (early 2018) An idea whose time has finally come? A startling shakeup & breakup of Route 8 (early 2018) that we’re still digesting. Changes to 9, 29, 92 and others. Also look for service frequency improvements a number of routes, as well as possible expansion to serve new suburbs and some townships. Some of the changes proposed by GRT for 2017. Underlying all of this is a strong growth target being set. After over a decade of skyrocketing ridership, 2014 and 2015 saw a decrease in the number of riders. Planners blame this on a loss of school board funded high school trips, the disruption of ION construction, and also on years of unrelenting fare increases that GRT has been directed to undertake. However, region staff expect ridership growth to bounce back and then some. Serving just under 20 million rides a year right now, the plan is to reach 28 million in just 5 years! This will take some doing. For one, ION will need to live up to its expectations. 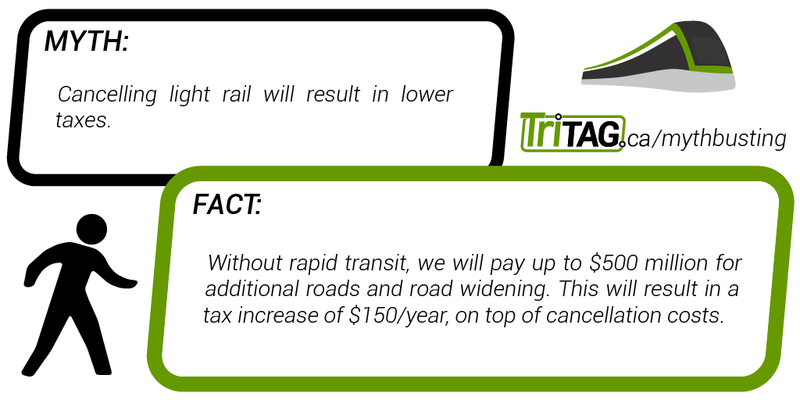 But the real question is whether our regional council is ready to make the investment in transit that this requires. This means committing to funding the expanded service hours (29% over 5 years) and to stop driving away riders– in particular, the new riders GRT seeks– with continuous fare hikes well above inflation. 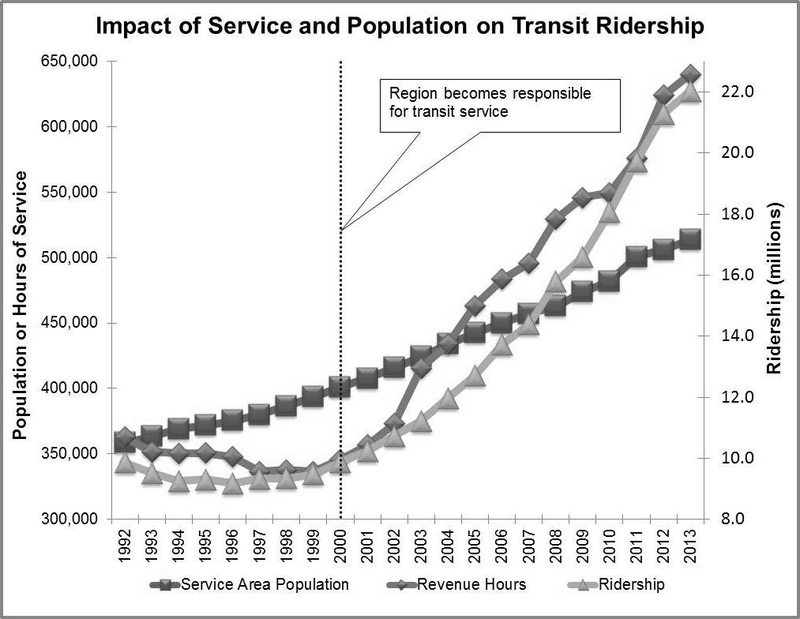 Regional government must commit to supporting ridership growth to hit these projections. There’s more in this report that catches our eye, but only so much we can go into in one post. Do the proposed route restructures make sense? Is GRT being too cautious and incremental in its redesign to meet lofty ridership goals? And is there an overemphasis on peak service frequency at the expense of all day flexibility? We’d like to delve deeper into these questions. Watch this space. Drop in anytime between 5 – 8 p.m. Bigger parking lots for new workplaces? Part 4 in a week-long series on parking in the City of Waterloo draft zoning bylaw. Is Waterloo’s proposed zoning preventing workers and their employers from reaping the benefits of rapid transit? The zoning bylaw review seems to drastically increase the amount of parking that “employment lands” will require. 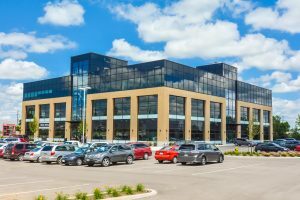 In a time where our region seeks to reduce congestion and sprawl by enabling commuting by other means than driving, it seems that the city of Waterloo is ready to force employers to build more empty parking spaces. 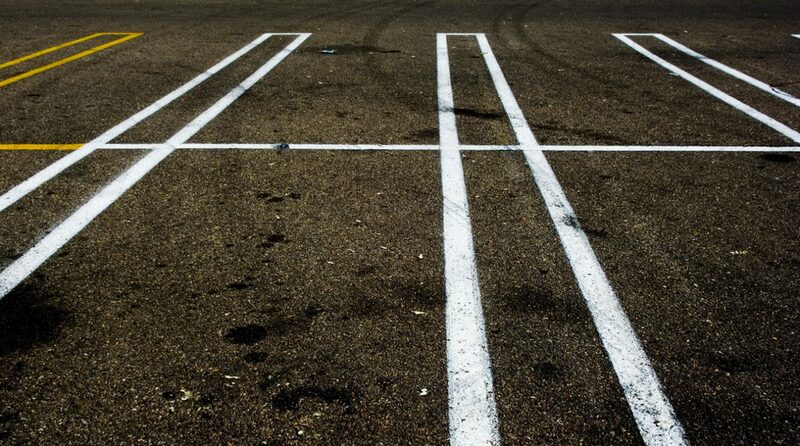 Minimum parking for industrial malls stands to increase by 20% . Single occupant buildings, if large enough, could see their parking requirements triple! While the old bylaw might have envisioned large warehouses and factory floors, the new rules clearly have offices in mind. Space-intensive industrial tenants may need to look elsewhere. The good news is that Waterloo plans on applying reductions to parking in certain areas like major nodes and major transit areas. The bad news is that the baseline requirement will be raised first, so a reduction of 30% near transit stations is actually a modest 16% from the old rate. Meanwhile new developments in the rest of the city must build more mandatory parking than before. Much like with residential parking, the additional cost of extra parking on employment lands must be borne by the employer. The presence of extra parking will serve as a powerful incentive for driving, even when it is unnecessary, and will be discourage employers from offering parking cash-outs or alternative benefits (such as free transit passes) to reduce their parking needs. These reduce the chances their employees will do anything but drive. By raising minimum parking requirements for employment lands, the City of Waterloo could be undermining a host of measures designed to give people more transportation choice, and increasing the space and costs for employers to locate in Waterloo. Ultimately this could result in more drivers on the road at rush hour. Write to the Zoning Bylaw Review staff and your city councillors, and share your concerns about parking requirements for workplaces in the City of Waterloo’s next zoning bylaw. Part 6: Could parking minimums hurt light rail? The existing rate of 2.5/100m^2 applies to the first 1000m^2 of space. A reduced rate of 1.0 applies after that, eventually dropping to 0.75 for space beyond 5000m^2. The new rate of 3.0 appears to be a flat rate. Photo credit: radcliffe decanay on Flickr, (c) 2006. Licensed under CC-BY. The votes are counted, the winners declared, and the dust has settled. What to make of the election that was to be the “LRT referendum we’ve been waiting for?” If it truly was such a referendum, that score has been settled: despite an enormous budget to support of a candidate who made his name known fighting the region in the courts on LRT, despite a former MP and a former weatherman both with massive name recognition also championing the cause, no LRT opponent was able to muster the support they thought their issue deserved. That’s not to say that the 76% of voters who didn’t vote for Jay Aissa are all pro-LRT, or that the almost 70% of residents who didn’t even come out to vote (come on, people!) are all ardent LRT supporters. Certainly not. But what the results clearly indicate is that overall, the people of Waterloo Region are satisfied with the direction we are moving in. And why not? Over the last decade we have seen the resurgence of our community’s once-dilapidated cores, a resilient economy which (while not universally strong) has not only survived but thrived in the face of the decline of a headliner employer, and the emergence of this region as the most progressive small city in Ontario for tackling the challenges of growth, sprawl, and sustainability. On the basis of our success so far, a majority of people are willing to accept that we must continue to plan for the future, and that we need continue to innovate. Many still reserve judgement on the most visible aspect of this plan (LRT), but they’re not interested in opposing it. Turning back now flies in the face of our community tradition of barn-raising and reinvention. Our no-nonsense progressiveness brooks no nonsense. This is the real reason the cancel-LRT crusade failed. For those of us who have supported and advocated for LRT over the years, today is a very good day: it marks the end of activity to halt ION which will roll out in 2017. But it is not the end to the challenges our region will face as it grows up. Certainly, last night’s results do not guarantee the success of ION light rail transit. Over the next three years, a very complex project will need to come in on time, and on budget… and it will then need to meet or exceed expectations. The early signs are good, but we have no certainty that it will continue. We have newly elected leaders who have committed to careful stewardship of what the previous council initiated, but that’s not enough. We all need to stay engaged and hold our regional government’s feet to the fire. We need to be the voice of conscience and of reason. We have to keep the pressure on council to make good decisions not just about LRT, but on transit as a whole, and the other complex issues that tie into it: growth management, affordable housing, and debt. After last Saturday’s rally, Jean Haalboom, one of the few supporting councillors willing to stand up for rapid transit and LRT, said to a few of us that we can’t just drop this issue on Thursday if this vote passes. We have to keep on it. 2014’s municipal vote could become a last-gasp money-burning cancellation movement if we go silent again after the immediate fight is won. Most of us support LRT because we’re thinking about the future, right? Well, it’s time we take the long view. LRT doesn’t get delivered if and when Council votes yes. In the years to come, we need to shepherd it home. It’s amazing how close that possible future actually came to becoming reality. The immediate fight was won, and then had to be won again, and again. Now we can say with some finality that “yes, LRT will be delivered.” Now we can focus on making sure that what is delivered lives up to the vision. After all, we’re not done yet: Cambridge has been left out in the cold, and one of the most meaningful gestures we can make to heal the rift and connect our three cities is to extend ION in Phase 2 without hesitation. Connecting Cambridge might take several years, but it needs to happen so we can start to think of ourselves not as three separate cities, but one region. We live in the 10th largest urban area in Canada, but our own community self-image is still catching up to this reality. Over half a million people call Waterloo Region home, and we can expect another 200,000 in a couple of decades. Our region has some serious challenges to face in the coming years. This election may have been a referendum after all. Will we confront the challenges that come with growth? Will we continue to plan and innovate to create a more livable, sustainable place to call home? Are we ready to invest in our future? The result appears to be a resounding Yes. In debunking Myth 2, we estimated the cost of running bus service to equal ION’s ridership in 2017 to cost $23.6 million, and by 2031 to cost $52.9 million. In comparison, the operations and financing cost of ION is $30 million a year. How did we reach these figures? Our estimate is based on the cost of providing enough service hours for a growing ridership along the Central Transit Corridor in KW. Cost per service hour is $138/hr for Waterloo Region in 2012 (sourced from the OMBI 2012 Performance Measurement Report, page 187). This figure includes amortization, meaning it accounts for the cost of the vehicle as well. Given that we’re focusing on comparative costs for ION stage 1, all numbers for 200 iXpress have been limited to the Kitchener-Waterloo portion only. Ridership targets for ION are 25,000 (2017) and 56,000 (2031). passengers per day. 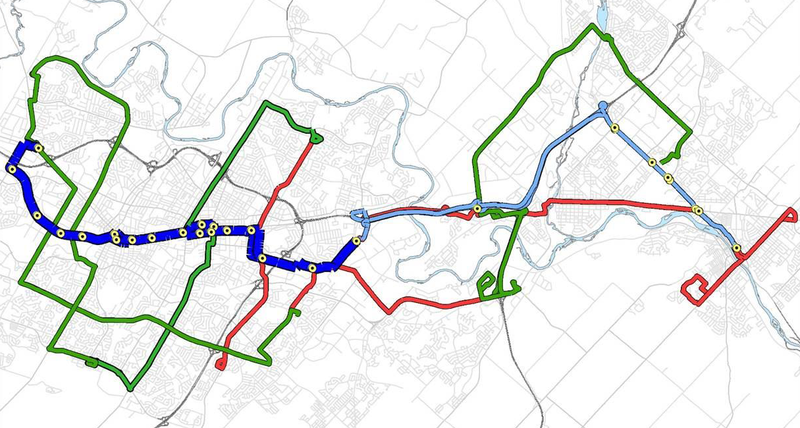 (Source) Central transit corridor ridership (route 7 and route 200 KW only) was 20,000 in 2013. Our cost estimate for serving 20,000 passengers is $18.9 million. Spreadsheet. Because the central transit corridor bus frequency is already driven by ridership, and peak time buses are routinely full, supporting further ridership requires a higher number of buses. Given that operator hours (i.e. wages) drive a significant part of service hour costs, we could possibly reduce this figure by introducing higher capacity buses (such as articulated buses.) However, our observation from the OMBI report is that Ottawa’s service hour cost is higher partly because they use higher capacity buses.